Bundl Technologies Pvt. Ltd, which runs food delivery app Swiggy, clocked a revenue of Rs 133 crore in the financial year ended March 2017, up over six-fold from Rs 20 crore in the previous year, show the company's filings with the Registrar of Companies (RoC). Losses, however, widened to Rs 205 crore in FY17 from Rs 137 crore in the previous year. Total expenditure, too, surged to Rs 345 crore from Rs 157 crore in the year prior, the documents show. Text messages sent to Swiggy co-founders Sriharsha Majety and Nandan Reddy went unanswered. 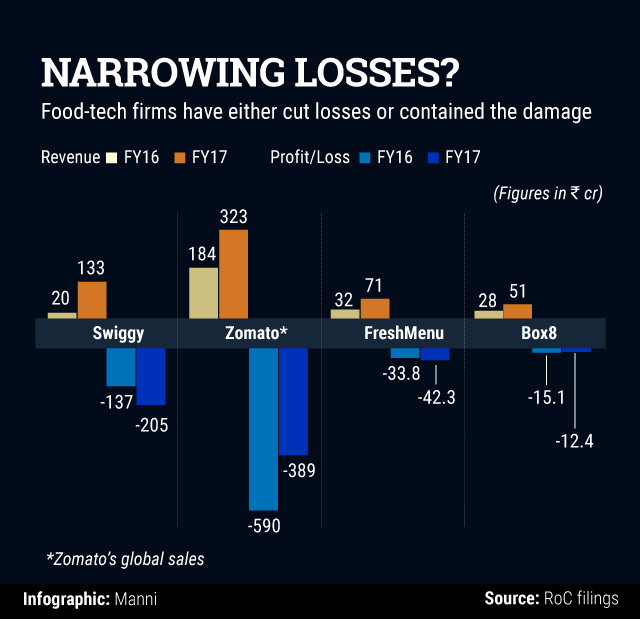 Restaurant-listings and food delivery platform Zomato narrowed its losses to Rs 389 crore in FY17 from Rs 590.1 crore in the year-ago period, according to the annual report of its largest shareholder Info Edge (India) Ltd. The company reported global revenues of Rs 332.3 crore for FY17, up 80.6% from Rs 183.9 crore in the previous year. Gurgaon-based Zomato Media Pvt. 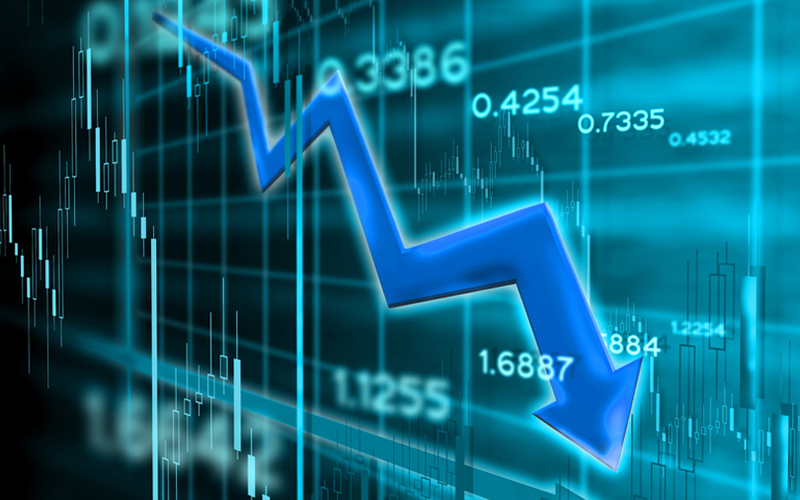 Ltd had announced in a blog that its cash burn dropped 81% to $12 million in 2016-17 from $64 million in the year prior. The company has also taken measures to enhance the efficiency of its ad sales team, the blog said. FreshMenu, another player in the food delivery space, more than doubled its net sales in 2016-17 to Rs 70.9 crore from Rs 31.7 crore. Net loss widened, albeit not substantially, to Rs 42.3 crore from Rs 33.8 crore, as total expenses increased to Rs 117 crore from Rs 67 crore. Mumbai-based Poncho Hospitality Pvt. Ltd, which owns on-demand food delivery service under the brand Box8, reported FY17 revenues of Rs 51 crore, up significantly from Rs 28 crore in the previous fiscal. Losses narrowed to Rs 12.4 crore from Rs 15.1 crore in the previous fiscal. To be sure, most of these players run different models and, therefore, their revenue and profit figures are not directly comparable. FreshMenu, for instance, has a cloud-kitchen model. It doesn’t aggregate, but prepares food in its kitchens. The industry has seen the emergence of a number of cloud kitchens of late, including Yumist, HolaChef, Petoo, Twigly, InnerChef, Bhukkad, and HelloCurry. While many of them have raised multiple funding rounds from venture capital firms, a few like Yumist were forced to trim operations. Some of the earlier ventures, like cricketer Robin Uthappa-backed iTiffin and SAIF Partners-funded SpoonJoy, had to shut down. “With the entry of UberEats and Google in food delivery, the war may continue. Zomato and Swiggy do not have a global investor like SoftBank or Tiger Global - finding such an investor is a logical choice for both. Though Swiggy is backed by the deep-pocketed Naspers, the South African conglomerate has not deployed large capital to compete. It has been very astute with its consolidation calls, whether you see RedBus, MakeMyTrip and ibibo, or PayU and Citrus... Thus, it can back Swiggy to merge with Zomato," says Devendra Agrawal, co-founder of investment bank Dexter Capital. Recent media reports said that India’s biggest e-commerce firm Flipkart was in talks with Swiggy for a buyout or investment. Besides, reports of arch-rivals Zomato and Swiggy exploring a merger have also been doing the rounds. Should a merger of the two companies go through, there will be several synergies to exploit. “It makes sense... You will have more efficiencies. How long will you burn cash?,” says Rahul Singh, vice president of National Restaurant Association of India and founder and chief executive of restaurant-beverage chain The Beer Café. However, believing that a merger will be value-accretive is not a foregone conclusion. In a separate development, Swiggy has launched its first centralised kitchen in Bangalore, christened Swiggy Access. The idea is to offer partner restaurants delivery-only kitchen facility for faster delivery. The 3,200 sq. ft. facility at Marathahalli, Bangalore houses three restaurants, namely, Leon Grill, Keventers, and Punjabi Rasoi, besides Swiggy’s private brands The Bowl Company and House of Dabbas. “With Swiggy Access, we are diversifying local palettes, bridging geographical gaps in supply... it will enable our restaurant partners to expand to newer neighbourhoods and a larger consumer base at a fraction of the expense," Majety said in a statement. The ready-to-occupy kitchens will offer the restaurants a basic setup with the required amenities. While Swiggy won't charge them a rent or deposit, Majety said the commission fees would be higher than marketplace charges. The company plans to set up more such facilities to bring at least 40 partner restaurants under the Access programme in six months.